In honor of Elana Johnson's Surrender book launch, she is hosting the Never Surrender Blogfest, June 11-15th. 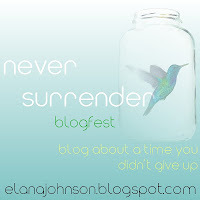 "All you have to do is blog about a time you didn't surrender. Trained for a marathon? Queried agents? Had to study for an entrance exam? I'm looking for inspirational stories that you have experienced. Hard things you've accomplished because you didn't give up. I want to be inspired by you!" I've never trained for a marathon or climbed a mountain. I did conquer my fear of roller coasters, but that's not what I want to talk about. I want to talk about never surrendering, trying to finish a book after the death of a very close friend. I started writing "Nameless" in August of 2011 and I was very excited about it. But in September, I found out that Chris wasn't going to make it to Christmas. I'd known that he had a brain tumor for a few years and it had been betting better, but it stopped getting better. This took everything from me. I didn't want to write anymore. He passed in November. I couldn't write "Nameless" and everything I tried to write was terrible; it was lifeless. I didn't want to read or write. Granted, I was probably depressed. But Chris always told me to never give up and that I could be whoever I wanted to be. It took until the end of January before I started to write again. At first, everything was still terrible. But I didn't surrender. I finished "Nameless" in April. I love it, more than anything I've ever written. I dedicated "Nameless" to Chris. I will probably still miss him for a long time, but I didn't surrender. And I won't because he believed in me. He taught me not to surrender. Do you have someone in your life that tells you to never give up? I'm sorry for your loss. It can be really rough, but it sounds like you dealt with that loss in the most positive way you could. You'll probably always miss him, but the fact that you learned so much from knowing him will keep a part of him with you. I know my sentiments may sound cliche, but I've learned the truth of them from personal experience. Thank you Laura. 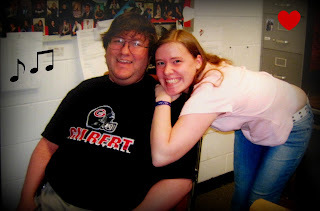 I probably will always miss him, but it's a good reminder of someone that always believed in me. He will always be watching over me. I'm sure Chris is so proud of you for finishing. The best way to honor him is doing what you did--never surrendering and finishing your book. Thank Jenna - I bet he is proud me, watching from heaven. I am sorry for loss. Death of a close friend is always hard to bear. I lost both of my grandparents within less than a year of each other. It broke my heart. Thanks. Death is one of the hardest things to bear and I'm sorry about your grandparents. A friend told me that we mourn and have pain because we loved that person. In order to remove the pain, we would have to remove the love and no one wants that. Thanks Dana! I'm glad that I finished too. Thanks for sharing your story. I'm sure he's looking down from above and is so proud of you and your work! That's a touching story. It sounds as if he was a great friend and a mentor with exemplary advice. You were very fortunate to have Chris in your life. As a teacher I am ever advising my students that they can do and be pretty much whatever it is they they want to be. I believe that with all my heart. Thanks for sharing your story and congrats on "Nameless." I'm glad you finished the book. Losing someone close to you is never easy, especially if they'd had the impact on your life that Chris had on yours. Thank you Christine. I'm grateful for the impact that he made in my life. Without him, I would probably be a different person. This is beautiful (and I'm tearful)!!!!! What a wonderful dedication! i'm so sorry for your loss, even tho it isnt recent, i'm sure it still stings. happy you pulled through and finished! and glad to know you! What a touching story. I love that the human spirit can persevere through something like this. Congrats on finishing your book! Thanks for participating in the blogfest! Thank you Elana! It is pretty amazing that the human spirit doesn't give up. 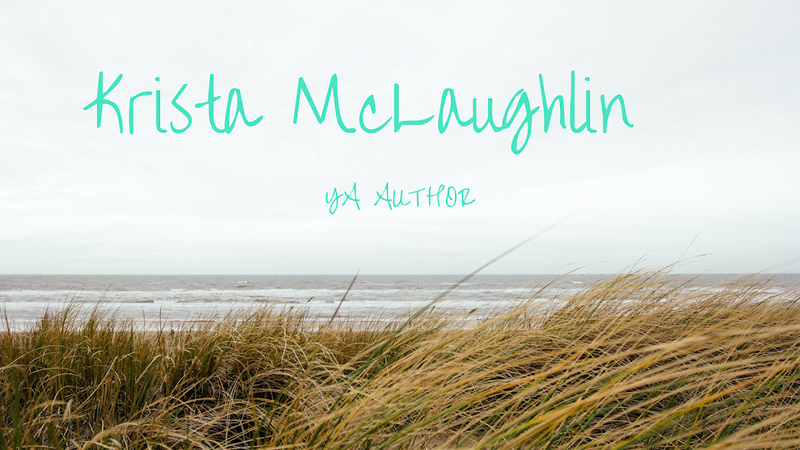 Congrats on your book release and the blogfest! I can't wait to read your book!